It started out simply enough. We wanted to get married again. It didn't take more than a few minutes on the Internet, however, to conclude that no one can get married "again" as long as you're already married. The best any couple can do is something called a Renewal of Vows. Further research suggested a Renewal of Vows can take any form, and does not need a minister or a piece of paper--nothing. It just needs two people who wish to make it so. 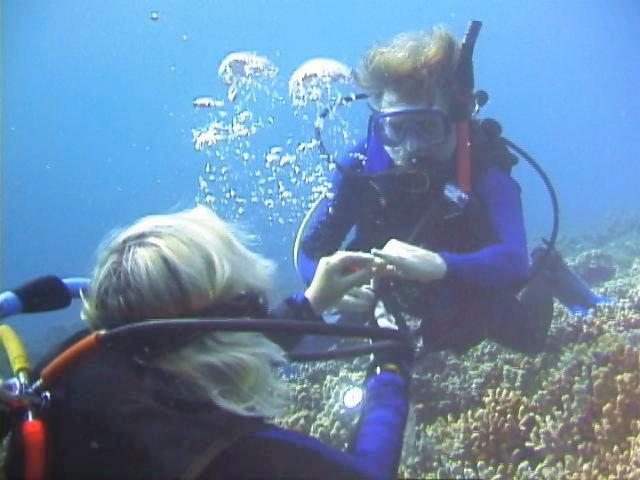 At first, we entertained a completely private underwater ring exchange--just us in front of the turtles. 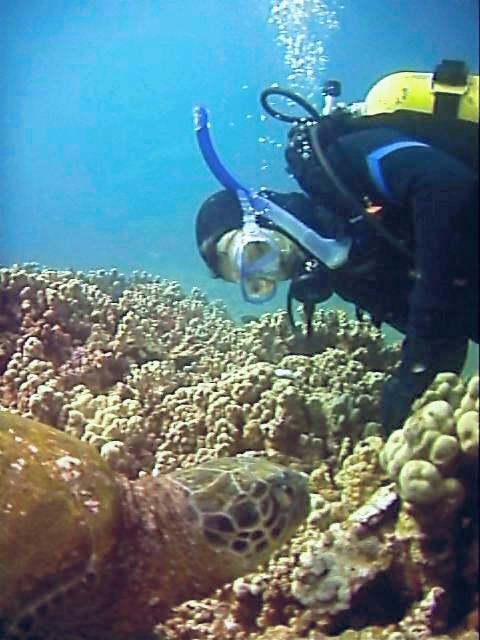 Whenever we think of the turtles--our dive site is blessed with so many of them--it's a quick path to thoughts of George Balazs and his crucial role in the research and recovery of the Hawaiian green sea turtle population. In fact, he was not only there when it all started, he started it all. I have a special favour to ask of you. We've decided that we'd like to do this underwater, probably at the Turtle House. It would mean a lot to us and make it very special if you would consent to be our witness, ring-bearer, and photographer. 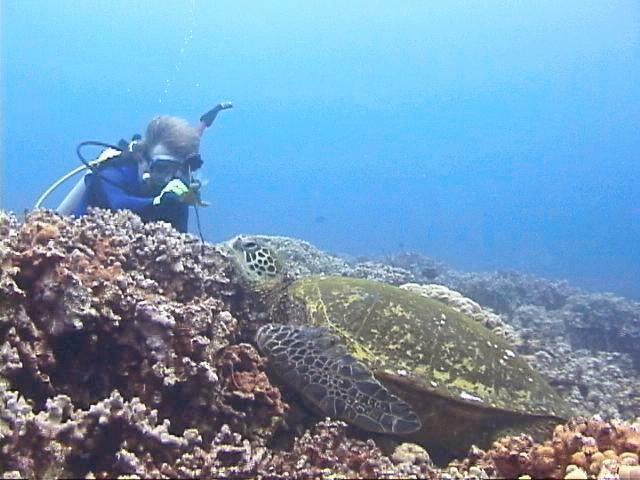 We're assuming that you will find at least one day to come and dive with us, and we both think that aside from the turtles, there is no better choice for someone to help us renew our commitment to each other. Mahalo for giving this your consideration. "Zeus," we said, "and if he's not there, then Tutu." 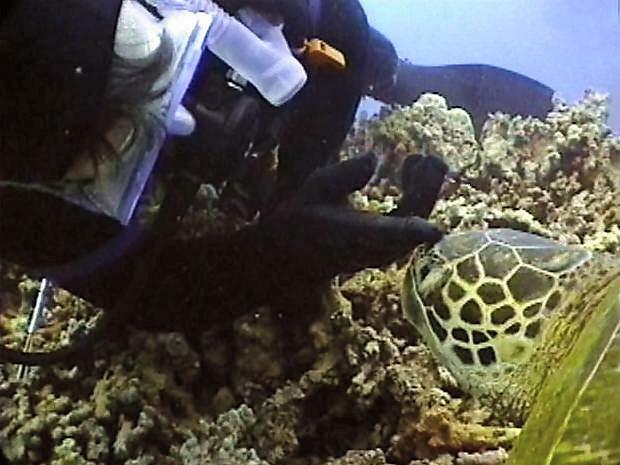 And so it came to pass that during the last week of our summer, George arrived on Maui to dive with us. On our morning dive we went to North House, fully expecting to find Zeus at his usual haunt--but he wasn't there. Neither was Tutu, but we didn't really expect her to be. She's a Reef 2 turtle. That ruled out conducting the ceremony on our first dive--good in a way, because it created the possibility of both Zeus and Tutu being at Reef 2, where our p.m. dive would be. We looked forward to the afternoon dive. The dive to Reef 2 is a stroll-in-the-park compared to the arduous snorkel to North House, and we knew we'd find at least one of our two "presiders" there. 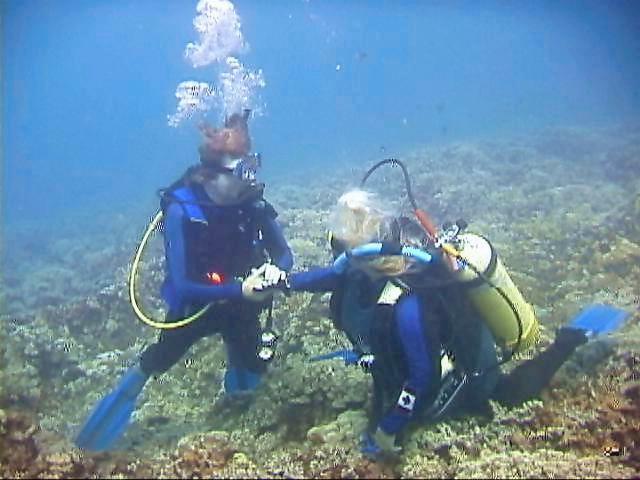 Still, no matter what the purpose of the dive, we always ensure the "work" is done first. We made sure George got good long looks at the Reef 2 turtles--conducting careful inspections on any turtles that would allow such close work. Then, we sighted Tutu, and her being today's Bird in the Hand we decided to perform the Renewal of Vows ceremony--but that's about all we'd agreed on. Seems all three of us had a different idea as to how things would go. Initially, we'd decided on George handing us the rings, but the rings we'd chosen were narrow. 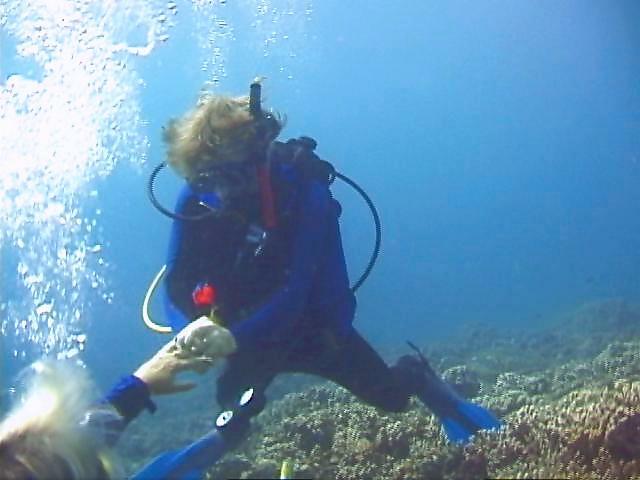 There was danger of fumbling and losing one or both among the corals, so I carried the rings instead. Next, it seems that no one knew what I meant by "we'll exchange the rings in front of Tutu." Both Peter and George took that literally. Knowing that Tutu prefers to keep humans at a respectful distance, I meant simply that Tutu had to be present--within eyeshot. So I took out the Ziploc bag containing both rings. Peter read that as a signal to remove his left glove. I removed mine. We're not quite sure when George realized the "ceremony" was underway but we do know it came as a surprise to him. Still, he started to roll the videotape in time, and the pictures you see below are frame captures from the tape he made. I removed my wedding band and Peter slid the Renewal ring successfully onto my outstretched finger. I then replaced my wedding band, and both my rings were safely in place. Now it was my turn, but I had difficulty getting the new ring over Peter's knuckle. A bit of fussing on Peter's part and both his rings were safely shining on his finger too. At this point I went to a script we'd agreed upon back in June. Hands signals. I point to me (I), fist to heart (LOVE), I point to him (YOU) and then I shook Peter's hand. This would symbolize our relationship as husband/wife (I LOVE YOU) and as colleagues (shake hands). At this point it gets interesting. Peter did not reciprocate. Instead he clasped his hand over mine while looking at Tutu! George "read" the gesture and understood. Of course, so did I. I guess there are as many different ways to say "I love you" as there are people. Zeus never did show up that afternoon. 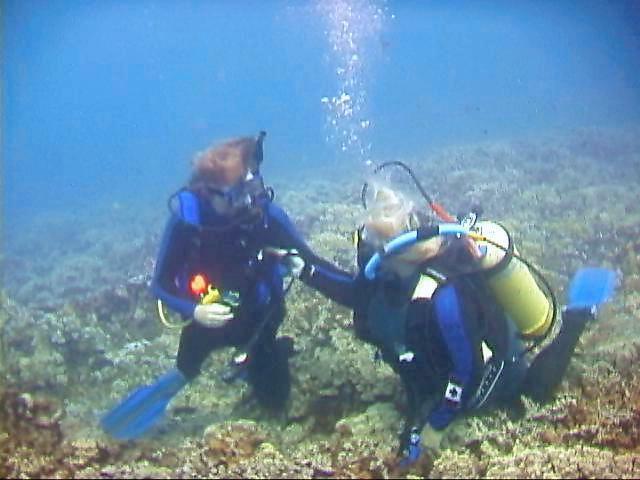 Peter sighted The Patriarch on the next dive, however. (I didn't, being too preoccupied videotaping another turtle.) I'm delighted to report that Peter settled alongside Zeus, pulled off his left glove and showed the turtle his new gold ring. No photo of that. Not even me witnessing that quiet moment. Just Peter and Zeus together underwater. Peter loves the honu almost as much as he does me. That suits me just fine.